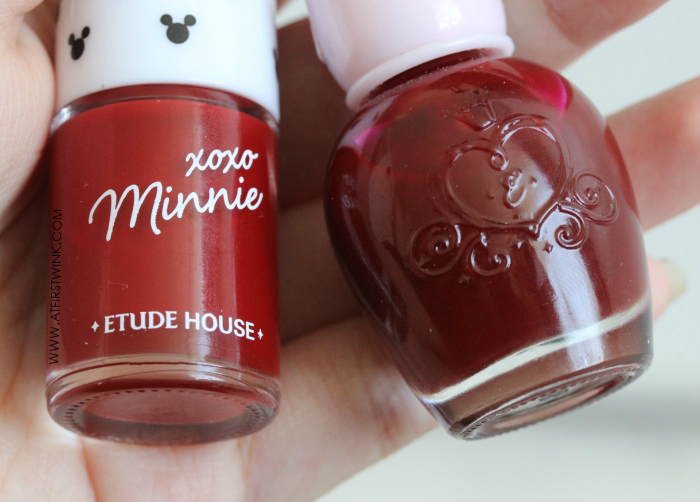 In my review on the Etude House xoxo Minnie nail polish 01 - Minnie Red, I mentioned that I had another wine red nail polish from Etude House and today, I wanted to show you how they compare side to side. The Etude House xoxo Minnie nail polish 01 - Minnie Red (on left two nails) has a deep red color with a brighter red undertone than the Etude House nail polish DRD301 - Why Wine. While I expected it to be the velvet like, mysterious dark red color in the promotional pictures from Etude House (see it here), it didn't turn out like that. The color does become darker than in my pictures over time, but still nowhere near the color that I wanted. Although I cannot hide my initial disappointment, it is still a very pretty red color. Etude House emphasized that the two color nail polishes in the Etude House xoxo Minnie collection have a special gel nail effect, but I was surprised to see that the glossy coat is very similar to the nail polishes from the Etude House Dear my deep color nails collection (of which the Etude House nail polish DRD301 - Why Wine also belongs to). There is no difference in the thickness or in the smoothness of the glossy coat of the two nail polishes on my nails. However, the consistency of the Etude House Why Wine nail polish is thicker and easier to apply. 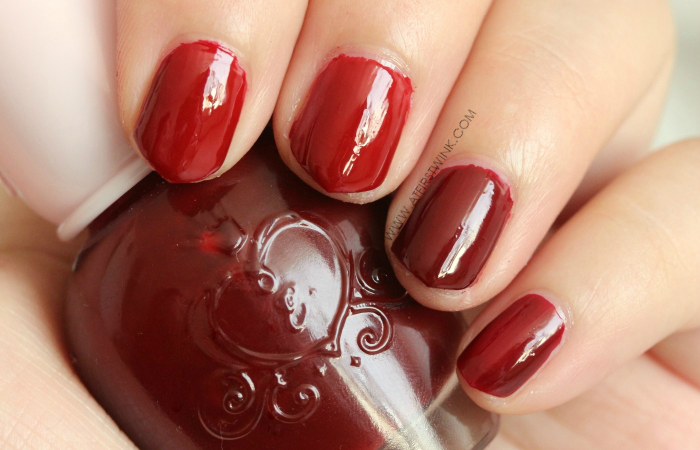 When I want to have vampy red nails? - I would take out the Etude House DRD301 - Why Wine. and when I want to have mature and healthier looking, wine red nails?